I am back after a break of 6 weeks or so as I was traveling. Earlier I used to schedule posts during my vacation period, but I no longer do that. Vacations are for time out, for relaxing and for family. So here’s a bread which I baked way back in April but posting now after I have found my bearing back. Vedanta saw photos of braided bread, challah in Peter Reinhart’s book the other day and was so intrigued by it, that he started demanding the bread be made immediately without fail. Since the Reinhart’s challah involves eggs , I couldn’t oblige him. But yes I did start hunting for an eggless version. 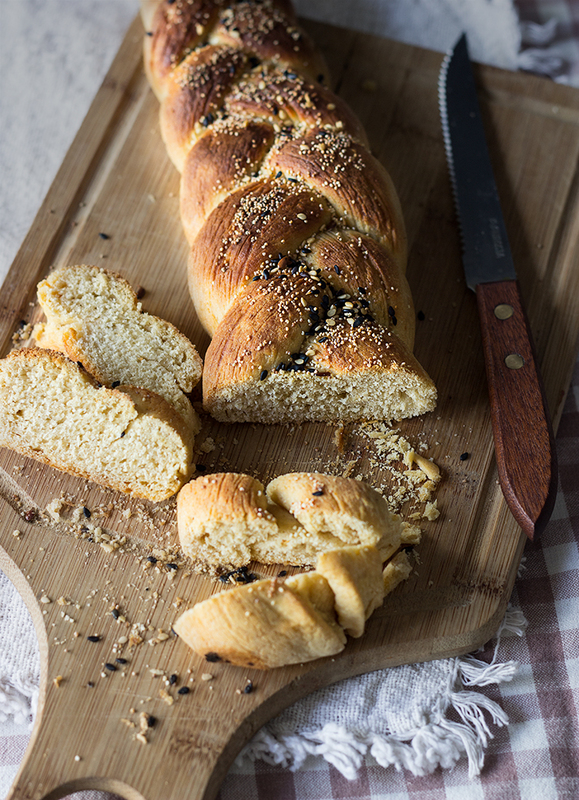 This recipe helped me enjoy the challah in it’s eggless form. I adapted the braiding and baking steps a bit using the Reinhart’s instructions, the basic recipe remains same from My Darling Vegan. I used whole wheat flour and all purpose flour to achieve this delicious and healthy bread. I also made this recipe into a very successful eggless Babka, recipe for which I will be sharing very soon. I couldn’t find black poppy seeds, so used white poppy seeds, black sesame seeds and flax seeds. It got a very big thumbs up from kids and V. A keeper recipe at my place. The secret to this bread lies in handling the dough using a dough scraper or pastry cutter and not ripping the dough. Braiding in 3 strands or 6 strands is totally a personal choice and I tried both types of braiding. 1. In a large bowl, stir together yeast, 2 teaspoons sugar and 1 cup of water. Set aside for 10 minutes for yeast to proof. In a separate bowl, mix gram flour and remaining ½ cup of water using a whisk. Set aside for it to thicken slightly. 2. Slowly whisk oil into the yeast mixture, followed by chickpea (gram flour) mixture. Continue whisking while adding the ingredients. Now add remaining sugar and salt. Gradually add both flours until the dough starts to come together but is still soft. Turn out the dough onto a floured surface and knead for another 10 minutes till smooth. You can use a hand or stand mixer on medium speed as well for this. The dough should feel soft and not sticky. You may need to add extra flour or water to get right texture. 3. In a well greased bowl, place the dough and allow it the first rise for 1 hour in a warm place. Keep the bowl covered. Punch down the dough and form smooth ball again. Allow it to rise a second time for 30 minutes. 4. Gently transfer the dough to a lightly floured surface. Use a dough scraper and do not rip the dough. You can make 1 large braided dough or 2 smaller loaves. Using the metal scraper cut the dough into 6 equal portions. Make clean cuts - do not rip. Roll the pieces into short ropes about 3 inches long. Cover loosely with a kitchen towel or cling film, allow it to rest for 5 minutes. Roll each into longer rope, about 10 inches long. Braid the ropes as per your choice into 3 strand or 6 strands like here. 5. Place the braided loaf onto a sheet pan lined with parchment paper. Brush the loaf with milk and mist it with cooking spray. Cover the loaf with plastic wrap. Allow the dough rise a third time for 30 minutes. Pre-heat the oven 220°C. In the meanwhile, brush the loaf with milk again and sprinkle generous amount if black poppy seeds or seeds and nuts of your choice. Allow it to rise for another 15 minutes, uncovered. 6. Reduce the temperature to 165°C and bake the loaf for 40 minutes or till the bread is nicely brown. Transfer the bread to a cooking rack and allow to cool completely before slicing. I couldn’t find black poppy seeds locally, so used the white ones which are easily available. The success of this bread lies in using dough scraper and not ripping the dough for anything. I also used the same recipe bake an eggless babka and it surely turned out very good.